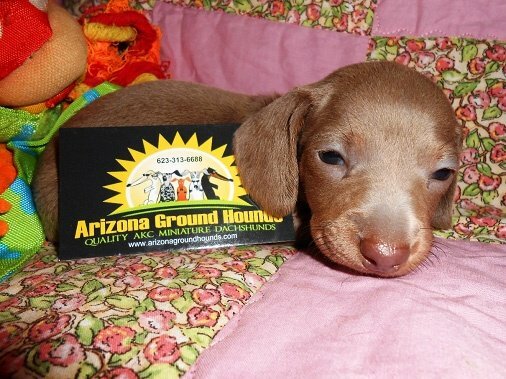 Arizona Ground Hounds would like to share dachshund history. Call us today. We are a wealth of dachshund information. Since the 16th Century, the Dachshund has been bred as a hunting dog. In Europe, during both World Wars, it was recognized as the national dog of the Teutonic Empire. Due to its German ancestry, it was mistreated and even stoned in the streets. 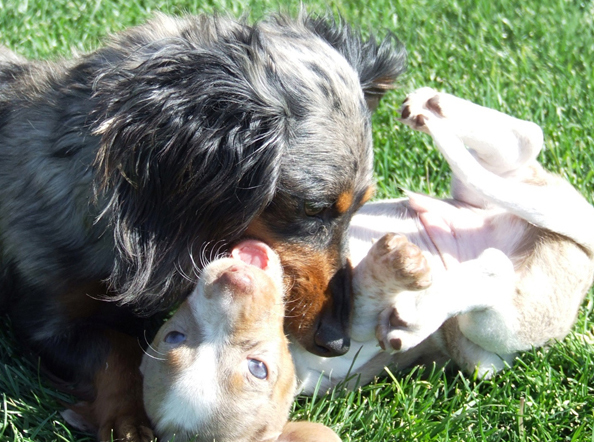 Today, the Dachshund is a popular breed known for being an excellent family pet. The name Dachshund (dachs= Badger; hund= dog) at once reveals and conceals the origin of the breed. Medieval European books on hunting, mention dogs that possessed the tracking ability of hounds and the proportions and temperament of Terriers. Since these dogs were used to follow badgers to earth, they were often called Badger-dogs or Dachs-hund. In certain parts of America, dogs bred to hunt rabbits are called rabbit dogs, suggesting a parallel. capable of depicting dogs with anatomical fidelity have always been rare. Thus, these woodcuts do not lend themselves to fine reproductions of coat distinctions. At best, the pictures and descriptive words can be interpreted with certainty only as defining the functions of the dogs used on badgers. The preponderance of available evidence indicates that smooth and longhaired coats were separated by selective breeding, prior to recorded registrations. The wirehaired coat was produced for protection against briar and thorn by crossing in harsh, wiry terrier coats and then breeding out incompatible characteristics of conformation. Early in the seventeenth century, the name Dachshund became the designation of a breed type with smooth and longhaired coat varieties, and since 1890 wirehairs have been registered as the third variety. The badger was a formidable twenty-five to forty-five-pound adversary. Strength and stamina, as well as keenness and courage above and below ground, were required of badger dogs. Weight of thirty to thirty-five pounds was not uncommon. Dachshunds in packs also were serviceable against wild boar. Soon, the breed was adapted to hunt other game. A smaller sixteen to twenty-two pound Dachshund proved effective against foxes and trail-wounded deer. Still smaller twelve pound Dachshunds were used for stoat and hare. In the first quarter of the twentieth century, miniatures with adult weights under five pounds and chest girths under twelve inches, were produced to chase bolting cottontail rabbits. Before the German Dachshund or Deutscher Teckelklub was founded in 1888, racial characteristics, or a standard for the breed had been set in 1879. German registration of Dachshunds was included (not always with complete generation data or systematic coat notations) in a general all-breed stud book, the Deutscher Hunde-Stammbuch, first produced in 1840, recorded fifty-four Dachshunds and the names of several subsequently prominent breeders. The publication of this guide continued until officially terminated in 1935. Importation of Dachshunds into this country antedates the earliest American dog shows or studbooks, and eleven were included in AKC Stud Book, Volume 11 in 1885. American dogs have found little employment in organized hunting, as we lack in the badger and wild boar and do not hunt deer with dogs, nor foxes with pick and shovel. The true character and conformation of the breed have been encouraged by frequent importation of German hunting strains. To encourage hunting capacity and exemplary conformation and temperament, field trials under AKC rules were instituted in 1935. What would the world be without a little bit of Dachshund!